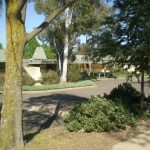 Photographs of Flynn Primary School in 2009, showing the landscape setting for the school and details of Taglietti’s architecture. 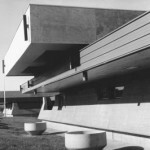 Photographs of Flynn Primary School in 1974, showing many of the striking features of Taglietti’s architecture – the angular, poured concrete walls; deep overhanging wood-panelled eaves and the use of drainage pots as an alternative to conventional guttering and downpipes. Photos by architect Enrico Taglietti, 1974. Promote the health, safety and wellbeing of the Flynn community. Promote the use of the Flynn community centre and grounds to meet the needs of the Flynn community and protect heritage and community values.